House Minority leader Rep. Nancy Pelosi today described Donald Trump’s popular immigration principles as “trash” and as “brutal” towards illegal immigrants, despite repeated election results showing that voters want migration policies to be fair to ordinary Americans. They call them principles — unprinciples! — they are not principles, they are trash — are unacceptable to the dreamers and those of us who fight for them. Democratic legislators at the Capitol Hill event insisted they would not compromise on their opposition to the principles, released October 8. The press event spotlighted the Democrats’ high-low coalition of financial elites and government-dependent people, and it excluded any mention of middle-class Americans’ worries about getting displaced or outsourced by the federal government’s high-immigration, low-wage economic strategy. For example, the event was organized by a lobbying group for Venture Capitalists, FWD.us, and it featured several illegal immigrants, including one Spanish-speaking illegal who spoke in broken English, even though she has been in the United States since 2000. Pelosi’s repeated declarations of concern for illegal immigrants was not matched by any statement of support for Americans, either as young students, as job seekers, employees, parents, or as taxpayers. She argued Trump’s pro-American plans are unpopular, even though numerous polls and elections show that Americans do not want other Americans to be sidelined by cheap-labor immigration. Polls show that Trump’s policies are popular because they try to balance Americans’ concerns about mass-immigration with Americans’ generous offer of citizenship to foreign immigrants. Those fairness policies are particularly supported in the Midwest — which flipped from Democratic to Trump in November 2016 — but are opposed by business groups which gain from additional lower-wage workers and welfare-aided consumers. The political power of Trump’s immigration fairness argument was noted by veteran Democratic pollster Stanley Greenberg.“Progressives will only get an audience with these voters if they listen to them and understand why they were desperate for sweeping changes, why they voted for Trump and what message they were sending to the elites about putting ‘us’ and America first,” said his March 2017 autopsy report. In 2016, former President Barack Obama pushed a pro-immigration policy, even as the federal government invited another 1 million foreigners to immigrate into the United States, just as four million young Americans began looking for decent jobs. Every Republican president for the past four decades has recognized the [immigrants’] constant reinvigoration of America. Look at Ronald Reagan … and George Herbert Walker Bush … George W. Bush tried so hard. are anathema to our national values. Together, these brutal proposals – each one of them is horrible – but the cumulative effect of them would destroy a fundamental part of the American character – a free nation proud of an immigrant heritage. It abandons — their proposal abandons the fundamental respect for family at the heart of our faith, at the heart of who we are as Americans. Protecting our dreamers and respecting our immigrant families unites us, and unites the three Bs – business, badges — our law enforcement friends — and bibles — our religious voters. 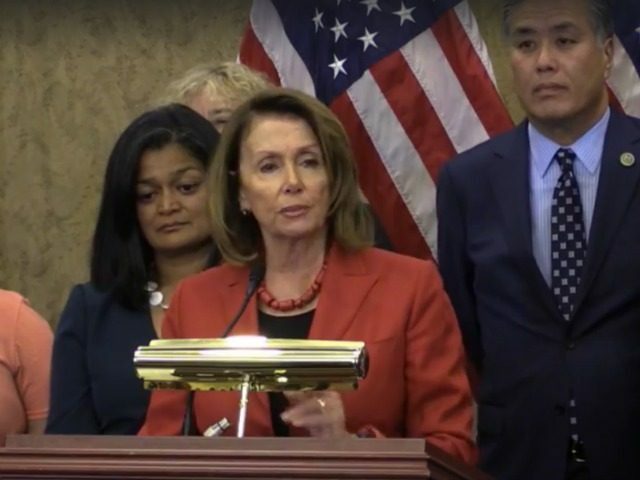 Pelosi’s concern for illegal immigrants, rather than for Americans, was shared by other speakers at the Capitol Hill event. Trump’s immigration principles are “literally a love letter to white supremacists,” said Democratic Rep. Pramila Jayapal, an immigrant from Indian immigrant and a former activist lauded by Obama’s White House. The goal of the principles “is really to end our deep history of immigration,” she said, even though Trump’s principles only call for a reduction in the variety of relatives that can be brought into the United States via chain-migration. the wall is bad for trade, bad for the economy, bad for the environment, bad for species migration, it is bad, and it is completely wasteful and it is part of a — in my opinion, my statement — hateful rhetoric intended to divide this country and to divide us from other nations. The young illegals seeking amnesty are “800,00 young people who are engineers and doctors or studying to be doctors and lawyers, or who do military service or law enforcement,” she said, without mentioning the many illegals who lack even a high-school education, and without mentioning the 4 million young American men and women who enter the workforce each year. The House and the Senate are “working very hard to do right by dreamers and right by the American economy, both,” Grisham said, without mentioning the economic hopes of ordinary Americans.